In Coca-Cola > Show & Tell and Toys > Marx Toys > Show & Tell. There are great deals out there on eBay for the patient and persistent collector. I was able to bring home this old toy for 5.6% book value purchased off a BIN listing. 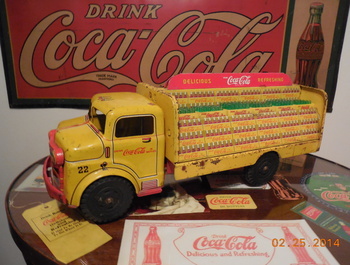 It is my third tin truck, which works well because The Coke Cave has 3 windows in the main section. So this one looks nice filling the third sill. I was recently called out for being boastful about my good deals. 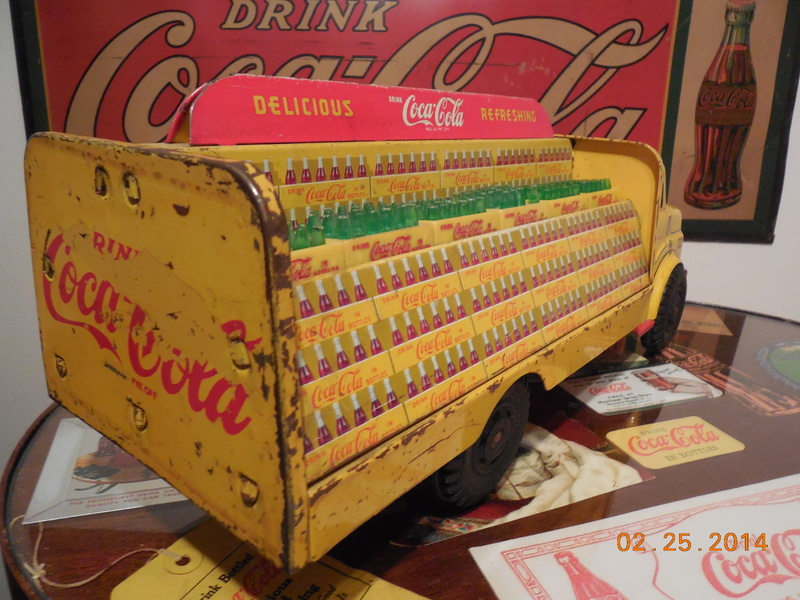 I decided early on in my collecting adventure to share my experiences (good and bad) here on CW, as there seemed to be very little in the way of information about acquiring quality Coca-Cola pieces at good prices. It's been a great journey so far! I appreciate all the nice comments and "love". There are a lot of fine people in this world. I've met some great online friends through CW and hope I'm not wearing out my welcome. I try to offer some positive input and guidance as much as possible in return. Nice find. That has the harder to find grill. I can't comment on the deal because I am not familiar with the coke price guides but the toy price guides are now just about worthless. Some of the ones printed before the crash are 60-70% off. Most collectibles are just not bringing what they did a few years ago. Thanks Tom. I haven't been in the game long enough to know for sure, but Coca-Cola seems to be holding over the past few years. Signs especially. eBay I think has been a game changer for the overall collectibles market, combined with high speed internet access to the multitudes. Hey, I appreciate the encouragement. From the 80's through about 2005 it was a collecting frenzy and prices were crazy. I have noticed some of the toys have been rebounding the last year or so, hopefully it will continue. I like your Coke Cave. You should note that the light coming in the windows will fade those trucks in short time. 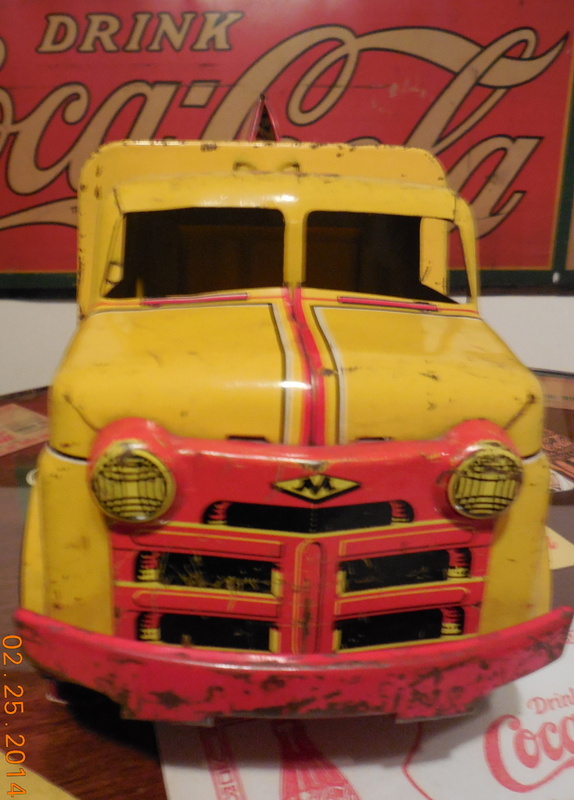 I got this same truck for Christmas 1958 I think. Too long ago to recall but I loved it. I believe my younger bother's son still has it. Thanks for sharing it. Thanks fhrjr2 for sharing the memory and that helps me nail down the date a little more. Nice that you passed in on to your nephew. Having the loose crated bottles included with this one was a bonus, I imagine many of them were separated from the toy over the years. AzTom, I've been meaning to buy shades for those small windows. Now I have extra motivation. Thanks again for sharing your experience. Did I miss something....being informative is far from boastful. I think it's helpful to know that there are still great deals to be had on great items and this truck is another fine example..... So brag away my friend!!!! Thanks Tommy, I enjoy your posts as well. I appreciate the support, 8-pack brother! 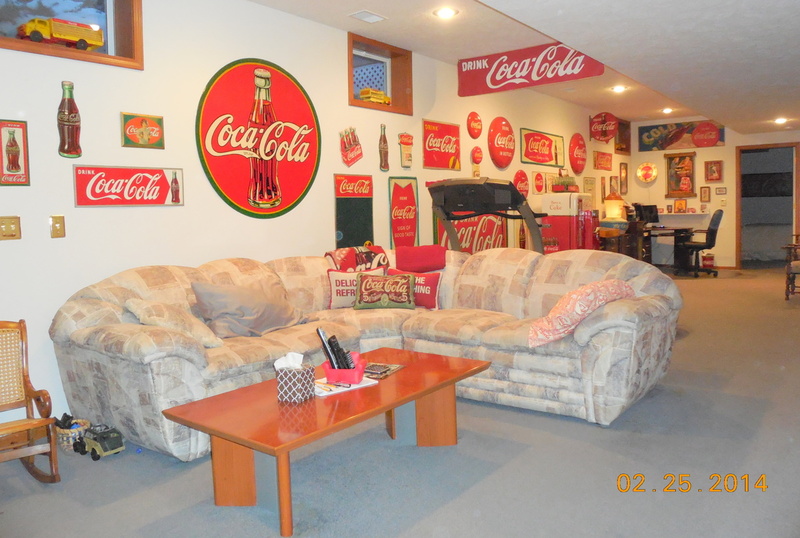 Your Coke room is awesome, there is nothing wrong with a good deal. That's a cool truck you sir are victorious be proud of your score!! Thanks Trey for the nice comment. Hope it's going good with you. You are proud of your truck. Why not boast? It is a real nice truck. If we don't talk up our collectables, who will?